The Volkswagen Tiguan can be considered a late entry into the compact Sport Utility Vehicle market. Despite the fact that most of its competitors have already established compact SUV models within their lineups; Volkswagen hopes the Tiguan will be able to successfully attract more customers. The Volkswagen Tiguan is available in both all-wheel-drive and front-wheel drive. It is powered by a four-cylinder 2.0-liter turbocharged engine. The name Tiguan in itself attracts a lot of attention. According to Volkswagen's marketing department, the name is a marriage of the words "iguana" and "tiger.” This vehicle has been built on same the chassis as the Golf and Jetta. In order to prevent this small SUV from resembling a hopped up Volkswagen Golf, the Tiguan utilizes styling elements that are similar to Volkswagen's larger SUV, the Touareg. 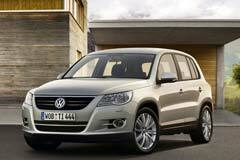 This gives the Tiguan a more aggressive and upscale look when compared to its competitors. The downside of the Tiguan is that it's less spacious and slightly expensive. 2018 Volkswagen Tiguan SEL 2018 Volkswagen Tiguan for sale! 2019 Tiguan 2.0T SEL 2019 Volkswagen Tiguan, Pure White with 8 Miles available now!